Unfortunately, the SCSI protocol can no longer provide the high performance and low latency that next-generation applications (NGAs) leveraging mobile, social media, and analytics demand—one of the many reasons NGAs are driving the transition to all-flash arrays. As the market continues to flux, mentality and methodologies do so in parallel which tends to blur the clear path ahead. 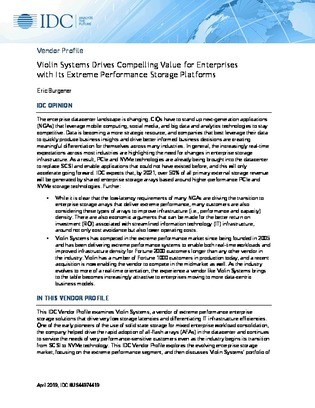 Thankfully, IDC profiles the evolving all-flash market in this analyst report, with particular attention given to AFA vendor Violin Systems and their role in servicing the needs of performance-sensitive workloads as the industry transitions from SCSI to NVMe technology. To stay on top of the latest developments, view the report here.